A very frequently asked question is where and how to buy the bento items and boxes mentioned here, especially in the Bento Item Spotlight  (formerly Bento Item of the Week) feature, as well as on other bento blogs and sites. I’ve listed you several options, which I hope will be useful. As much as I love online shopping, I believe in shopping at your local stores first. You’re supporting your area’s businesses, and you don’t have to pay shipping costs. Besides, it’s arguably a bit better for the environment (especially if you take public transportation!) since the goods have already travelled to your area. Even if you local stores don’t carry ‘genuine’ Japanese bento boxes, it’s always possible to find alternatives for lunch boxes, dividers, picks and other accessories. As I wrote in one of the earliest articles on this site, it’s not necessary to buy a box that is labeled as a Bento Box  in order to bring bento lunches. You can use cupcake cups, paper or silicon, as bento dividers, picnic utensils, and so on. Check out the JustBento Bento Gear Flickr pool  for a lot of creative ideas from fellow bento enthusiasts. Any general housewares/kitchenwares store or megastore with such a department is a good place to prowl for bento-friendly goods. If you live in an area with Asian dollar stores, aka 100-yen stores, they are usually a good source for cheap and cheerful bento boxes and equipment. In the U.S. these for now are mostly in California and the west coast, though New York also has a few. Japanese or Asian housewares stores may also carry some things. To locate Japanese grocery (and related) stores near you, consult the reader-contributed and commented Japanese grocery store listings  (go to your geographical area page from there) on Just Hungry. Also check out the Bento Store Locator  on Lunch In A Box, another user-contributed listings page (Note: this hasn’t been updated in quite a while, along with the rest of the site, unfortunately). Japanese bookstores and giftstores can also be worthwhile looking around in. Kinokuniya  for example carries a decent selection of bento boxes. I was at the Kinokuniya US flagship store in New York in January 2011, and the gift department manager told me that bento boxes are becoming so popular, she has increased the shelf space for them by 5 times in the last couple of years. That’s great news for bento fans! Of course Japan is the best place to buy bento stuff. 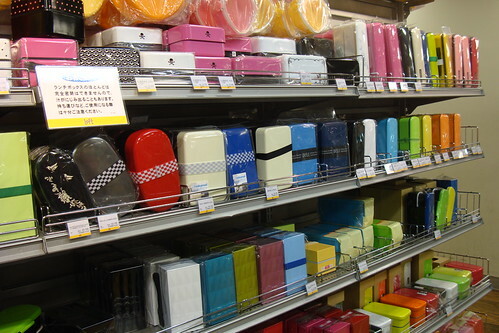 Be sure to check out Where to buy bento boxes and accessories in Japan. if you’re planning a trip there. Besides Japan, where are good places to shop for bento gear? You might not necessarily plan a whole trip around buying bento stuff, but it might be handy to know if you are in the midst of a bento mecca, just in case! The San Francisco and San Jose area in California - home to Ichibankan stores, a Mitsuwa Marketplace in San Jose, and more. See the Japanese food shopping in California page . The Los Angeles/SoCal area has several Mitsuwas as well as Marukai and Daiso. Honolulu, Hawai’i has a huge Japanese-American population and plenty of stores that cater to them. I spotted bento boxes at Marukai (you may need to purchase a 1-day membership), Shirokiya, and so on. See Bento Sightseeing in Hawaii . The New York-New Jersey area is less of a mecca than California or Hawaii due to a smaller Japanese-American population, but it has a Mitsuwa, several small Japanese grocery stores, and the biggest overseas branch of Kinokuniya. 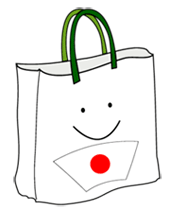 See the Japanese food shopping in the NY-NJ-CT area page . Paris also has a fairly large expat community, and the Japanese quarter is quite worth a visit if you are a Euro-based Japanophile. See A Frugal Eats Japanese blitz through Paris  and Bento sightseeing in Paris , and Workshop Issé . If your heart is set on getting a ‘real’ Japanese style bento box, for most people mail order is the only option. The good news is that the number of international shipping-friendly online bento supply stores is increasing, and getting in better stock, all the time! Some people have a mental hangup about buying from suppliers that are not located in their country of residence. While international shipping costs are expensive, you should always compare the price of an item sold by one supplier vs. another, including shipping costs and sales tax or VAT, and see which ends up to be a better deal for you in the end. Personally I order from merchants based in Japan all the time. Shipping from Japan is usually very fast and efficient. I usually select SAL as my shipping option, which takes a little longer than EMS or FedEx (about 2-3 weeks), but is cheaper. SAL shipments usually (though this is a crapshoot really) don’t incur customs fees. FedEx or DHL are usually the most expensive shipping options, though they are reliable. FedEx shipments seem to always incur customs fees. EMS is the best choice if you want to receive mail via the postal system fast; EMS shipments incur customs fees about 50% of the time for me. I don’t have the patience for sea mail usually (and most vendors do not offer it since it’s rather unreliable). You may or may not be charged customs fees when your shipment enters your country. I’ve found that generally speaking, smaller orders tend not to be charged customs, though there doesn’t seem to be a hard and fast rule that applies all the time. I have tried most of these stores myself (ordering as a regular customer, no special treatment!) and have been very happy with their services. I think you will be too. Bento&co  (English site) ; (French version of the site ); is based in Kyoto, Japan. Owned and operated by husband and wife team Thomas (from France) and Erico (from Kyoto). Very attractive website, clear listings. Their selection leans towards the sleek and elegant rather than cute-kawaii. I’ve been a longtime customer since I love their taste and the quality of their products, and am always happy with their shipping speed and communication. Ships worldwide. J-List  and its PG-rated part (same store without ‘adult’ products) JBox . This store remains one of the most reliable sources of bento supplies, with a large selection of all kinds of styles. They ship just about anywhere in the world. 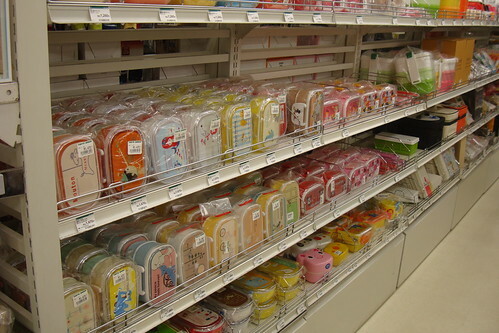 Japan Centre  carries a small selection of bento items from Daiso, the major 100-yen shop. Non-food items are shipped worldwide, and food items are shipped throughout Europe. (Their physical store in London carries a bit more than is listed online. If you want them to carry more online I think it’s worthwhile to let them know about it.) Ships mostly in Europe but will also ship worldwide. All Things For Sale  is a US based seller of bento goods and more. They have a large selection of affordable bento boxes and such. Flat rate shipping within the U.S., also ships worldwide. CasaBento  carries a wide selection of bento boxes of various styles (cute, traditional, modern), accessories and supplies, as well as kitchenware, including 220V rice cookers. They guarantee fast shipping and response times, and ship worldwide. Quoted shipping times: 2-3 days to the UK and Europe; 5-8 days to the U.S., Australia/NZ, and other countries. The online catalog in English, French and German. Ships worldwide. Amazon.com also has an increasing selection of bento supplies  for sale. There are also lots of goods sold on Amazon that can be used for bentos, such as silicone cupcake liners that are great as bento dividers. Please check out my Amazon aStore . You can find also find plenty of bento goods on Amazon Japan  of course, but none I’ve seen so far ship internationally. But you can try using the shipping services for shopping from Amazon JP - see below.) Check out my Amazon Japan aStore  (note that listings are in Japanese). From Japan With Love  carries a very nice selection of reasonably priced bento boxes and accessories such as face punches, inner cups, bags and a lot more. You’ll especially love this site if you like cute/kawaii designs. Ships worldwide from Japan. ILoveObento  is a US based online store with a variety of attractive bento boxes. Ships worldwide. Note: As of March 2011, they are only carrying the Gel-Cool line of bento boxes. Bento Crazy  is an online store run by Myria, a mom of 2. Formerly based in Japan, the store is now based in Maryland. Mostly cute and kid-oriented selection Check out the blog here . Ships within the U.S. only. Sugar Charms  is a cake decorating supply store that also carries a lot of bento things. Ships within the US only. J Flair Homestyles  carries many bentos with the popular Shinzi Katoh designs, and other cute bento boxes. Japonmania  carries a good selection of bento boxes and supplies, as well as many other products from Japan such as clothes, household goods and more. Ships worldwide. Omiyage  - a Canadian bento, zakka, and crafty products seller. 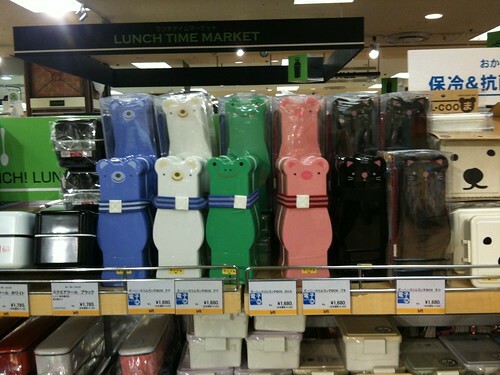 Besides their bento supplies, check out their very cute stationery from both Japan and South Korea. Lunch A Porter  - A Canadian bento seller. Ichibankan USA . The online store of this California based 100 yen (dollar) shop sells ‘cheap and cheerful’ bento boxes as well as higher quality ones from Hakoya (a well known bento box maker). Shipping is within the continental US only at the moment but is scheduled to start shipping elsewhere soon. Update: Ichibankan USA has now closed their online store indefinitely, but their San Franciso area-based brick-and-mortar “100-yen” (dollar) stores are still in operation. The main source of the widest variety of bento gear for non-Japanese speakers and residents is eBay. There are now dozens of merchants selling bento related supplies. Whenever you are buying something, make sure to comparison shop (some merchants are way overpriced). Most merchants are based in Japan or Hong Kong, and ship worldwide, but expect to pay quite a lot for shipping. I like to stick to the merchants who have clear descriptions of the dimensions and capacity of the bento boxes they sell. Did you know that eBay offers RSS feeds of their listings, based on search terms? You can set up one and subscribe to it in your favorite news reader. For bento things, go to Advanced Search and enter bento in the terms to search for, and enter amy, cd, music, mac, osx, software in the terms not to search for. This filters out all, or most, mentions of Amy Bento (an aerobics instructor), CDs and music related items from Brazil or Portugal (Bento is a popular nickname in Portuguese it seems), and listings of Bento the software program. You can also select House and Garden as the category. Once the search results page is generated, scroll down until you see the RSS button, and click on it to subscribe. You will get a nice listing with prices and thumbnail pics. This is how I generate the eBay Bento listings page  (which you can just bookmark if you don’t want to bother with the searching). The items listed on eBay, J-List and such are only the tip of the iceberg when it comes to bento gear - a lot, lot more is available only in Japan. Unfortunately, most of the online stores that sell them are in Japanese only, and do not ship overseas. But you don’t have to give up there. If you don’t have a handy friend or relative that lives there, there are an increasing number of shipping service web sites that will get the stuff you want and then ship it to you, for a fee. The fee varies but is usually around 10-15% of the purchase price, plus the actual cost of the goods and shipping. Some sites also charge a membership fee. This route may only be for serious collectors, but considering that they are offer a combination of translation, buying, shipping and payment services, it’s a fairly good deal. An updated list of shipping (or shopping) services is maintained on this page . One that has gotten several positive comments is i-tm4u . For instance commenter Anna from Russia used them to buy a handcarved wooden bento box , and ODG from Hong Kong also had a positive experience . A new service that looks interesting is Flutterscape  if you want a ‘friend who shops for you in Japan’ kind of experience, albeit with strangers of course. Update: Rakuten now has an International section - see this forum discussion . A Rakuten shopping guide is in the works. So you are planning a trip to Japan. You want to stock up on bento boxes and accessories. Where should you go? There are stores to cater to many needs and budgets. Note that this guide is biased towards the Tokyo metropolitan area, but the general principles apply to other areas of the country. The school year in Japan starts in April, so mid-February to early April or so is the big period for school supply shopping. Many young people who graduate from high school or university in March move away from home and start their new lives in April too. Mid-March to April is also the time when people go out in droves to appreciate the cherry blossoms (o-hanami), with picnic bentos in tow. 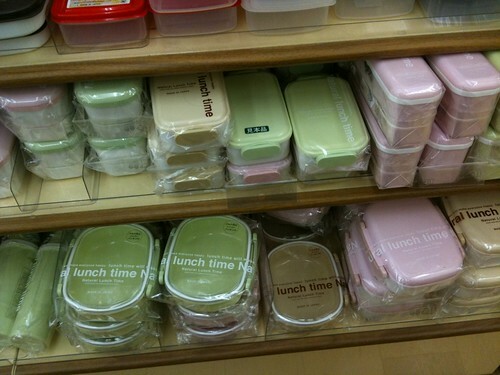 So this is the big time for bento goods. You’ll see a big selection and lots of discount deals around. 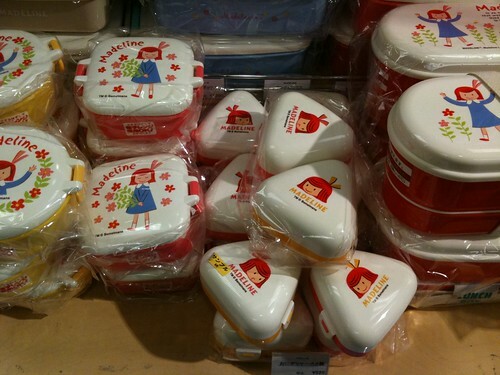 However, you can buy bento goods at any time of the year, especially at the specialist stores. If you are looking for the most inexpensive bento boxes and supplies available, then head towards a 100 yen shop. This is the Japanese equivalent of the ‘dollar store’ concept in the U.S. (See how much 100 yen is in US dollars at current exchange rates ). Not everything sold at a 100 yen shop is 100 yen (some bento boxes for example are 200 or even 300 yen), but the vast majority of things are. At a 100 yen shop, you will find everything from bento boxes to utensils, picks to wrapping cloths (furoshiki), water bottles and more. Tip: Bento boxes are typically located in both the kitchen supplies area and the ‘character goods’ area, so remember to look in both places. 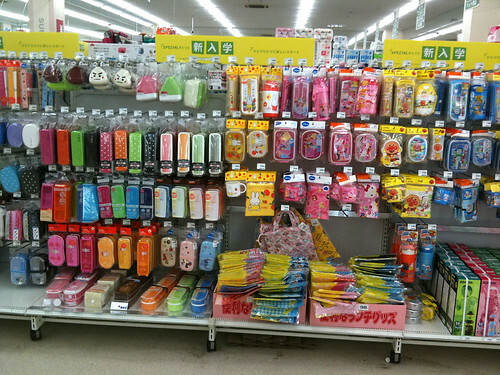 Daiso ダイソー　(limited store listing in English  complete listing in Japanese . Daiso has been opening stores in North America and Asia recently too. Their lineup of bento products doesn’t differ that much in Japan. Can Do キャン・ドゥ　(store listing in Japanese ) They have been opening stores in China recently it seems, but have yet to expand elsewhere. Seria (store listing in Japanese ). My favorite 100 yen shop - more below. Natural Kitchen ナチュラルキッチン　(store listing in Japanese ). A limited number of stores in major metropolitan areas. As the name implies, they specialize in kitchen products. Lawson 100 and Shop 99 - I’m not sure if they have merged, but they seem to share the same web site anyway. Limited bento supplies, but they do sell a lot of 100 yen foodstuffs and such. Operated by the kombini (convenience store) company Lawson. (store listing in Japanese ). Most 100 yen shops are located within shopping malls or department stores. (You can also find other one-price-for all shops such as 300 yen shops, 500 yen shops, and so on.) Most of them sell the same products from the same manufacturers, especially Nakano Co.  (see more about their bento boxes such as Lube Sheep and puti fresh ). Savvy bento supply shoppers will already be familiar with these from various online sellers. I’ve visited at least one branch of the stores listed above. My favorite is Seria - they have a nice selection of bento related products, as well as a lot of other cute or interesting kitchen, craft and bathroom supplies tht might appeal to the typical bento-ing fan. I’ve seen lots of cute picks, utensils, wrapping cloths and drawstring bags, and more there. The stores all have a bright, open feel and good selection of products. The one negative thing about Seria is that their bigger stores are out in the suburbs, more often than not in shopping malls that are not that easily reached by train. Their Tsutsuchigaoka store  and their Yokohama Center Minami store  are located close by a train station however (the latter one is the one I go to the most; I’ve also been to stores in the Machida area, where my sister lives). My second favorite store is probably Natural Kitchen. Their bento supply selection is not that big, but they do have quite a lot of cute things for the kitchen and elsewhere to gawk at. Daiso and Can Do are rather similar. I get the feeling that I’ve seen all their stuff already - if you live in an area with a Daiso store, or have visited one, I don’t really see any reason for you to make a trip to a Japanese Daiso unless you really want to. Prices are a little cheaper in Japan than they are elsewhere, which is a plus of course. I’ve visited both small and large Daiso stores, including the biggest one in the Kanto (Tokyo metropolitan) region, which is near Machida station. Note that a 5% consumption tax (equivalent to VAT or sales tax) is added on to your purchase, so a 100 yen item will actually be 105 yen. Any midsize or larger supermarket has a section dedicted to bento supplies. For instance my local Aeon/Jusco store has an aisle for character-oriented kid bentos, as well as one for more grown-up, restrained bento supplies. Prices are higher than at 100 yen shops - a typical character-adorned bento box, suitable for a child or someone with a small appetite, costs around 1000 to 1500 yen. Adult-sized bento boxes are around the same price. 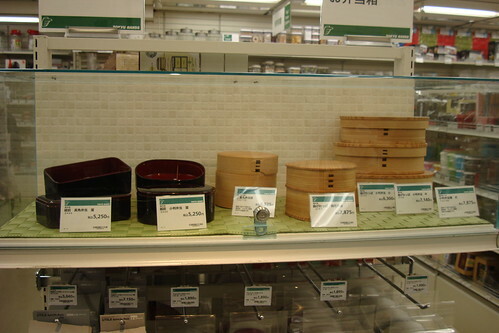 For regular bento boxes and goods, look in the kitchen goods area of a department store. The selection of goods they carry varies from store to store. If a department store has a LOFT store or a 100 yen shop in the building, their own kitchen supply department may not have that much to offer in the way of bento supplies. Many department stores also have a traditional Japanese crafts department, and they also periodically hold regional fairs on their ‘special events’ floor. These are the places to look for high end, traditional bento boxes such as magewappa, lacquerware, and so on. Kyoto, Nishi Nihon (western Japan) and Tohoku (northern Honshu) themed regional fairs are most likely to have some really nice bento boxes around. (Takashimaya, Isetan and Matsuya tend to have really nice regional fairs, but other department stores have them too.) 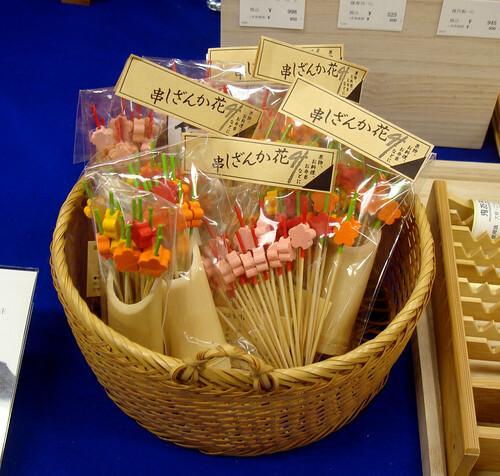 The bamboo picks below were on sale at a regional Kyoto fair held at Sogo department store. The two stores that have big, dedicated bento supply sections are LOFT and Tokyu Hands. Both chains maintain stores within department stores or shopping malls, as well as standalone stores. 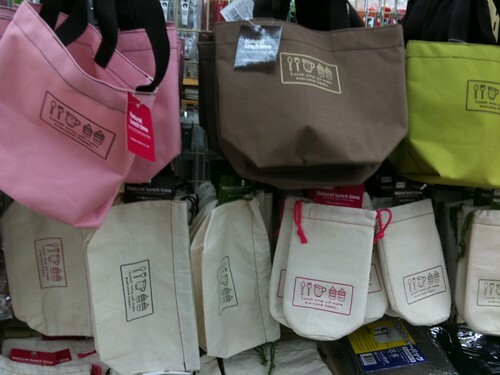 If you only have time to go to one or two stores for your bento needs, you should seek out a LOFT or Tokyu Hands. If I had to choose one or the other just based on their bento supply selection, I would lean towards LOFT. However, Tokyu Hands is such a fun store to browse through anyway, I would really recommend you try to get to both. Bento boxes sold at these stores range from around the 1000 yen range to 5000 yen and more for wooden boxes. The average is around 1500 to 2000 yen. All kinds of bento boxes for all ages and genders are available. Most of the boxes are plastic, but are more durable than the 100 yen shop type. Brands that you may recognize include Hakoya, Yellow Studio, Gel-Cool, Prime Nakamura and Aizawa Kobo. You’ll also see a wide variety of accessories, utensils and bento making goods that you won’t see sold by international online stores (especially eating utensils). The kitchen supply areas are worth browsing through too, for an abundance of cute and unusual gadgets. LOFT store listing in Japanese . The big (大) stores in the Tokyo area are in Shibuya, Ikeburukuro, Kichijoji, Yokohama (in Kanagawa)　and Omiya (in Saitama). I’ve been to the Shibuya  store (a standalone store on Inogashira Do-ri) and the Yokohama  store (on the 7th floor of the huge Sogo department store, directly accessible from the Higashi (East) entrance of Yokohama station). The bento section is a bit bigger in Shibuya, but the Sogo department store has the advantage of having a Muji store right next to it. Besides bento things, LoFt has stationery and office supplies, art supplies, cosmetics, toys, snack foods, bath supplies, and gifts. The constantly playing theme music will drive you batty. Bring earphones. Tokyu Hands store listing in Japanese . I’ve been to the Shinjuku, Shibuya and Yokohama stores - all standalone stores, They are all about the same size. The Machida store, which occupies the 6th and 7th floors of the Tokyu Twins building (right near the Machida station, South entrance), is a typical store-within-a-store; it has a slightly edited version of a standalone Tokyu Hands, but the bento department was still well stocked. 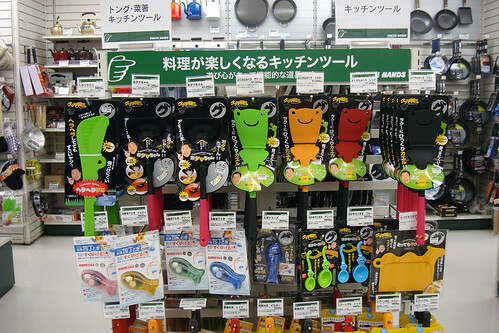 Besides bento things, Tokyu Hands stores have kitchen supplies, craft supplies, stationery, gifts, and home improvement items. Muji (Mujirushi Ryohin) carries 2 basic bento box models, a flat, large one and a narrow, stackable one, in black or white. I like these a lot and use the white one in particular far more often than the rest of my bento boxes put together. 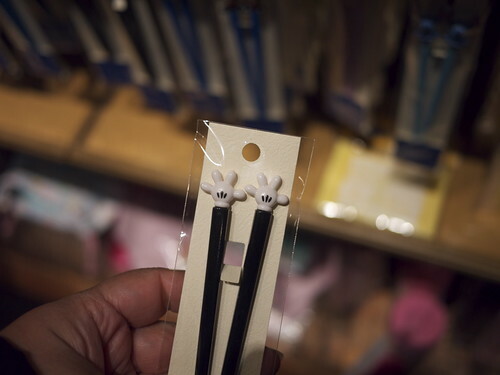 They have matching black or white chopsticks with cases too. Muji products are a lot cheaper in Japan than at their overseas stores. Most Muji stores are located within or right next to department stores. You will often find unique bento boxes at stores dedicated to zakka (雑貨 - a catchall term for ‘things’ or ‘stuff’ - acccessories for the home, fashion stuff, kitchen supplies, etc…), boutiques, kitchen supply stores, and the traditional kanamono-ya (金物屋）or hardware and home supply store. Be on the lookout! 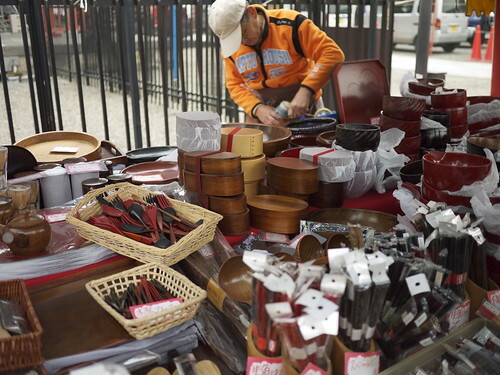 If you chance upon a crafts fair, you may find stalls selling wooden or bamboo chopsticks, accessories and bento boxes. Again, if you are into traditional crafts, be on the lookout for the regional fairs at the major department stores. You may have heard about Kappabashi, the famous kitchen supply wholesale area in Tokyo. Is this a good place to go for bento supplies? If you are looking for the type of bento box used in restaurants (shokado bento), with the compartments and the flat lids, or perhaps a special wooden lacquerware box, then yes. But if you’re looking for that cute little Mameshiba box you saw online, then no - you should head to LOFT instead. However, Kappabashi is a fantastic place to go if you’re just into kitchen stuff, not to mention those famous plastic/wax restaurant food display models (warning: these can be expensive). 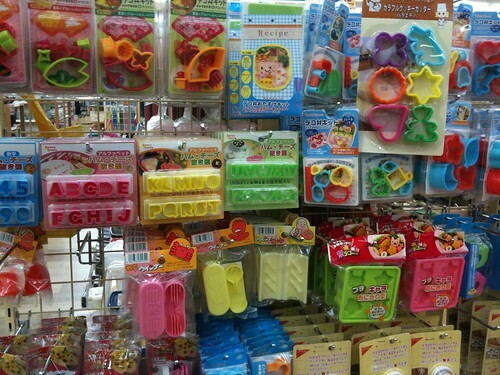 You can find things of interest to bento-crafters such as interesting cookie/food cutters and so on. Note that prices for retail customers at Kappabashi stores are not cheap. How about konbini (convenience stores)? Don’t they have everything? Personally, I don’t like the quality of the bento boxes sold at 100 yen stores. You do get what you pay for, I believe. However, 100 yen stores are great for picking up accessories like picks (which tend to break after a while anyway), as well as disposable items like paper or aluminum cups. You can also find some character-goods for cheap - for instance, I saw an Elmo bento box for only 100 yen at Seria. I do notice that often, the same item would be sold at a 100 yen shop and a LoFt or Tokyu Hands - except that at the 100 yen shop, there would be fewer items in a pack (for instance, fewer picks or cups) than at the regular-price shop. If you have time, try to comparison shop! If you are concerned about buying things that carry the Made In Japan label - since, after all, you are visiting Japan - then you won’t find much to buy at a 100 yen shop. Most of the bento boxes sold at LOFT, Tokyu Hands, and better department stores are actually made in Japan, whether they are made of plastic, metal or wood. The accessories such as picks and cups are usually made elsewhere, usually in China. Finally, if it’s in your budget, you may want to take a look at a real wooden magewappa and lacquereware bento boxes, as well as ones made of woven or solid bamboo, that you will encounter at the regional and craft fairs as well as some specialist shops. These traditional handcrafted boxes are a work of art as well as being practical boxes. 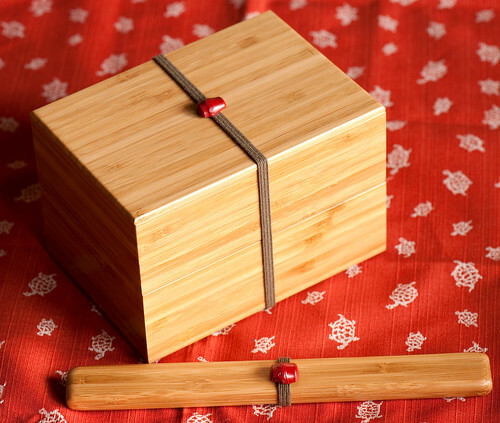 The box below is a handcrafted bamboo box from a specialist store in Kyoto. It’s expensive and needs to be taken care of, but it’s such a pleasure to hold and behold. I have put together a Google Map  of some of my favorite bento and other shopping destinations in the Tokyo-Yokohama area. (Note that I like crafts and stationery stores more than fashion-clothing stores or anime figurines and such.). It’s a work in progress, so please be patient :). I’ve also started working on a Kyoto map , to accompany my Postcards from Kyoto series over on Just Hungry - the first in the series is up there now .